For those of you who have never seen a box of transhipped corals upon arrival, we&apos;d like to show you some examples of what you may expect. Corals that have recently been shipped do not always look the way you might be used to seeing them, this is because they are in full retraction, which is something you never see at your store. This might seem alarming at first sight and you might think something is wrong. In reality, it is normal and nothing to worry about. Most stores buy tanked corals from wholesalers, which are fully extended when they're bagged and shipped. Tranship corals are different in that they are packed on the other side of the world and usually make about an 18-20 hour trip from tanks, in say the Indonesia area to LAX, where they are repacked. In our case, they get a pH-adjusted acclimation into 100% new water, oxygen, and bags before continuing on to you. Then there&apos;s another 18 hours or so in a box without waterflow or light on the way to you. Most corals retract far more than you would expect or even guess is possible during this 36-40 hours or so from origin to you. A 3-inch mushroom can be a half-inch across on the rock, an inch zoanthid can be a quarter-inch button on the rock. A 6-inch leather can be 2-inches tall and weeped over. Hard corals retract so far that their septa show lots of snow white. They are not dead. 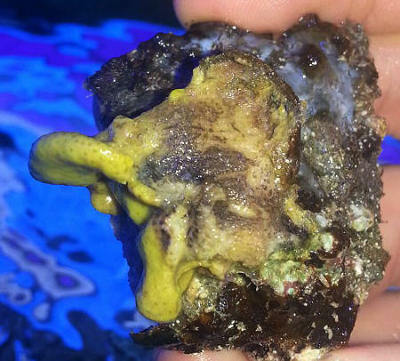 These are normal conditions for a coral after a two-day shipping transit. This is why it is pointless to try to photograph them as they go through. They are closed up. 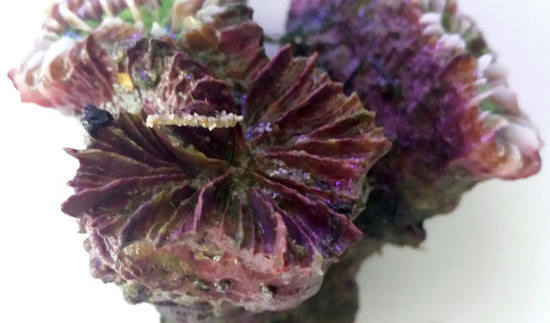 If you saw a coral like that in your store after it had been there a while, there may well be a problem, but it is to be expected on corals that just spent a couple of days without light or waterflow during shipping. Sometimes zoanthids may take a few days to open back up, star polyps too are famous for being slow to re-open. Most things will leap at the light and water flow right away, some fairly quickly and others overnight. But some take longer. Consider the anemone you see above the waterline at low tide in a tidepool. A small fraction of itself compared to when underwater in feeding mode. This is how corals and polyps react during shipping as well. Incidently most anemones are usually shipped dry, without water. They are pulled, and drained prior to bagging. 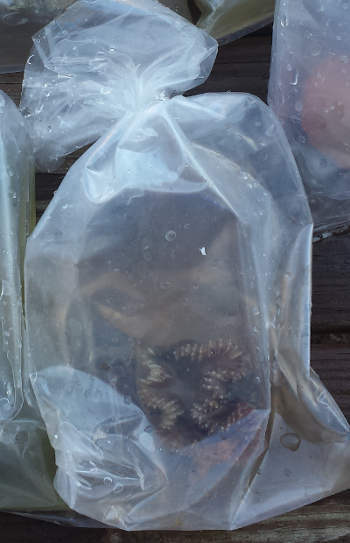 Folks say "there was hardly any water in the anemone bag" ... actually there was none when they packed it, that is the rest that drained during shipping after it was drained. Some fancy colored carpets are shipped in water, but this is risky if the box is thrown. A retracted anemone can take this as it makes a harder ball. More than once, we have had folks call us the day they got their box, upset, thinking their coral was dead, and calling to apologize the day after. From disappointment to ecstatic, overnight. Some have sent us photos of corals they thought were dead that were not. The corals just need a little time to rehydrate and get back into the swing of things. Sometimes leathers blow themselves up and deflate several times to flush themselves after shipping. This is normal and we want you to be aware of what to expect as much as possible. Here are some photos we have received showing the retracted state of transhipped corals that is normal and to be expected. Hopefully, this will help to illustrate why there&apos;s no need to panic or worry if you don&apos;t need to. We fish folks do that enough anyway! With hard corals upon arrival, as you can see in this Caulastrea (often called Candy), the septa are normally exposed whereas in a store they are not. The meat of the coral contracts back into the skeleton to protect itself. The bright white septa show it is not retracted due to ill health and dying. This is what they do in shipping. It is normal and what you should expect to see when you open a bag. There would be algae on the septa if the coral were receded due to ill health. The septa are snow white, which shows you it was a healthy, fully extended good coral when it was shipped. Worry if you see green algae on exposed septa, usually seen in corals in poor condition in stores, you won&apos;t see it on our corals. We have the snowiest white septa of them all. Here again, with hard corals, especially Lobos, they retract fully into the skeleton, exposing the toothed septa they are named for, which you do not normally see ("Tooth Coral" is a common name for Lobos). Note the septa are white and clean, this is what you want to see. That means they have been covered by healthy coral. The septa are snow white, no algae, so you know the coral was extended and healthy when shipped and is in shipping retraction now. The bag looks like it lost water, but the coral is obviously still fine, just retracted as expected. This is not dead or DOA, it's how a Lobo retracts in shipping. Here is another Lobophyllia in normal shipping retraction. The meat can fully retract into the skeleton, this is how it protects itself. Here you can see the mouths open and respiring, so you know you have a healthy live animal. When a coral that has been in a box for a couple of days arrives, this is how you should expect it to appear right out of the bag. The meatier the coral, the more retraction. A small Elegance Coral comes all the way out and is four times the size of the skeleton and you are glad it is not any bigger. Here is an example of how leathers weep. They deflate themselves and retract or fall over, often contracting to half or less of their fully blown up normal size. This speckled leather looks good for being just out of the bag tranship. Some of it is still up, but these lay down immediately, and blow up real fast when they get back into light and waterflow of a tank. This is how you should expect to see many leathers on arrival. Deflated is the term I like, all you have to do is add water! Actually light and flow which can&apos;t be stressed enough. That is what it needs "mostest fastest." This is another weeping leather to show how they deflate. This Yellow Leather has some dark on the trunk and might have a problem. The brightest ones are the hardest to ship, doesn&apos;t it figure? But it should go into the tank with light and flow, the bent over deflated aspect again is perfectly normal. Then if it does melt, clean it off the rock and put the rock in the tank as it likely has other stuff on it that can colonize your live rock, and, it may grow back from the roots left in the rock. If you are used to seeing corals in tanks at stores, we understand the concern, but after a day in a tank with light and waterflow, most leathers that look like this out of the box are fine. Over a day or two, it will likely inflate and deflate a couple of times to flush itself. 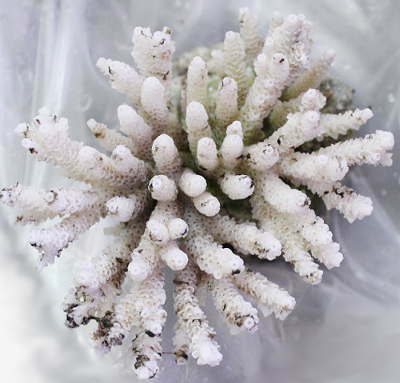 This is common among soft corals after shipping, then they re-extend into normal fully blown-up posture, which can take a few hours or a few days. So if you see it blow up, and then deflate, don't worry, it is most likely flushing itself, a common normal behavior after shipping. That water feels good. This is a Tonga Torch. It is not uncommon for an old dead head to be left on a coral, with the theory being that bad bacteria can't enter the main column. Here you can see on the one head shown well that coralline algae covers one head septa and all. It's obvious that this head died many many moons ago for it to be completely covered in coralline. It had nothing to do with what was sent, of course. 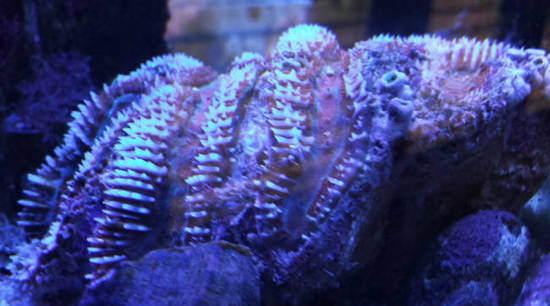 The two heads that are facing away both barely show the bright neon green retracted meat and the bright snow white septa, showing it was a healthy coral. The photo was sent to support a DOA claim, with the live heads hidden from view, showing a head that was not live in the last year to support the claim. Sometimes corals come in with the odd coralline-encrusted head left on it for beauty. 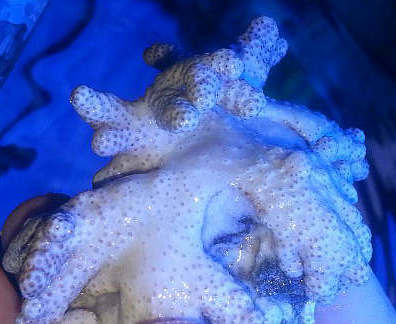 When that occurs, it doesn&apos;t have anything to do with what is on the bill from the collector, they know that they were shipping a coral with two live heads and one coralline encrusted head. So, this coral is not considered dead since the one head that is not alive hasn&apos;t been alive in years! That was not the part we were paying for. Leaving it keeps the stem sealed. Eventually it gets coralline on it. Extraneous coralline encrusted heads do not constitute a dead coral. Note that many corals are exposed at low tide. So if you get a bag without much water, don&apos;t panic. The bag probably popped recently enough that it won&apos;t affect the coral. Our packers and the cargo folks *at LAX* are beyond very good with the boxes, and are often on a first name basis. Cargo handlers at LAX know how important the fish mover people are, we are one of the top ten air-freighted cargoes. They just don&apos;t like heavy rock boxes. LOL However, some destination or connecting cities, not so much. In all odds any popped bag just recently happened in transit and the coral will be fine. That is about 90% of the time. A few hours will not kill most corals. Many years ago, I was told a story told about a coral shipment that mistakenly went to Brazil and was packed for three days; the only things that lived were the dry packed (paper wrapped) items, which then included the mushrooms! You would be amazed at how we have seen things come in, and they live fine. This often happened when all of this was new, mostly decades ago, before some of us figured it out. Two days was not uncommon. Being out of water is usually not a problem, even for leathers, unless you are a fish. If a coral or fish is dead upon arrival at LAX, it will be in a dry bag with rock salt when you receive it. This way, you know your boxes are not being cherry-picked and you don&apos;t pay domestic freight weight for water on a dead item. If there is no rock salt in a dry coral bag, then it just popped along on the way. Get it in water and light fast as you can. It will probably be fine tomorrow. 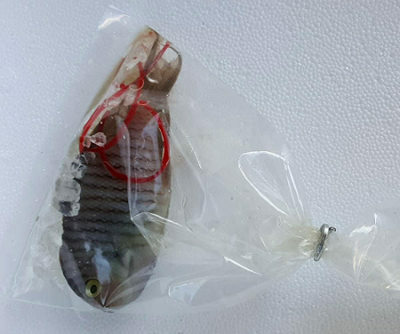 If your fish or coral is in a dry bag like this one, clipped closed with rock salt in it, it was dead at LAX. It won&apos;t be clipped in a manner that appears like a bag that was once filled with oxygen and water. All of the above coral photos were sent to support dead claims. None of them were dead yet. They were in retraction, which we understand is at a level the average hobbyist has never seen. 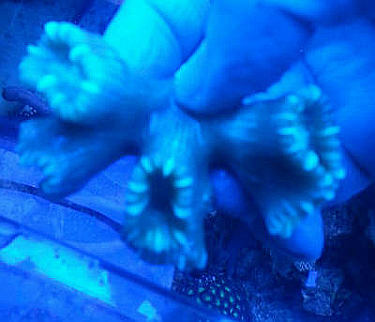 So we wanted to share them with you so you can better know what to expect when ordering tranship corals. You will see septa on LPS coral skeltons like you never did before, weeping over leathers, teeny dots of big shrooms or zoas, and everything is fine. Just add water, light, and flow. One day of water flow and light and most will be fully open. The meatier the coral, the more retraction. This is a DOA. They are typically skeletons completely bleached white. There is no meat there. If you see colored meat, usually it is alive and well, just retracted. We ask for your help if you have DOA, and please remember we cannot make any claim for any dead with any shipper without a photo, which is why we require photos to support any dead claim. It&apos;s not that we don&apos;t believe you received a dead coral; we simply can&apos;t even report it to ask for credit without a photo. For myself, only having salt tanks with corals since the late 1970&apos;s, (they were powered with a bicycle then) I have never thrown a rock away that a coral came in on. Any rock almost always has other stuff on it, *that you can&apos;t order*. Usually different types of corallines, and other encrusting things. And who knows what is in it. Yes could be a pest, but more likely biodiversity that can&apos;t be beat or bought. Plus there are roots in the rock of whatever died, and most of these things (not LPS, but soft corals, shrooms, zoas, in particular) can regenerate themselves from a few cells. I have seen so much grow back you wouldn&apos;t believe it. Net it, using a fine mesh fish net with the top of net out of the water for a day or few and watch closely if the fear of pest is great. I do not see the sense in throwing away any rock just because it had a dead coral on it. It is still useful. It is often a piece of premium live rock at the very least. A coral may grow out of it at best. We hope you see better what to expect when you see a coral that has been in a box for the better part of a couple days. We shouldn&apos;t expect fully-extended corals similar to how they are after being in a tank for a week or month, when they first arrive from being transhipped. Thanks for reading and preparing yourself so as to not be so surprised when your zoa rocks arrive closed and stay that way a day or two, or your leathers are weeping and your LPS are showing their teeth. Happy arrivals!